Caption slip reads: "Photographer: Lapp. Date: 1952-03-16. Reporter: Mandel. Assignment: Houses bombed on south Dunsmuir Avenue. #31: Officer F.O. Clark and John W. Potts, 32, who lives there, inspect damage from bomb at 2135 South Dunsmuir Avenue. Front door was blown off and furniture in house damaged. #22: Scene at 2130 South Dunsmuir Avenue where bomb blew front window away and strewed wreckage about frontroom. 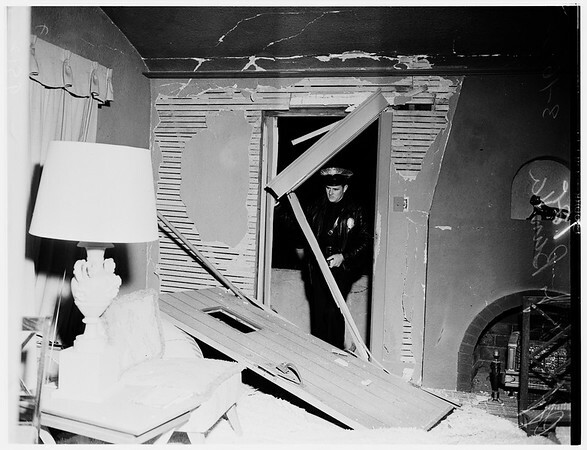 #21: Officer Sergeant S.S. Barth inspects bomb damage at 2130 South Dunsmuir Avenue where front window was blown off and front room wrecked. #12, 11: Officer B.J. Bunda inspects bomb damage at 2135 South Dunsmuir Avenue".